Cut broccoli into small florets and keep it aside. In a pan, boil water adding little salt. Add chopped broccoli and boil it for 2-3 minutes. Switch off and put the boiled broccoli in to cold water taken in a bowl (blanching). Heat another pan and add butter. When it melts, add chopped onion and saute till light pink. Add chicken pieces and saute well till cooked. Add plain flour and saute well. Then add chicken stock and allow to boil well adding little salt and 1/2 tsp pepper powder. When it starts to thicken, add milk little by little and the blanched broccoli and mix well. Add 1/2 tsp pepper powder and salt if needed and boil it for 5 minutes. 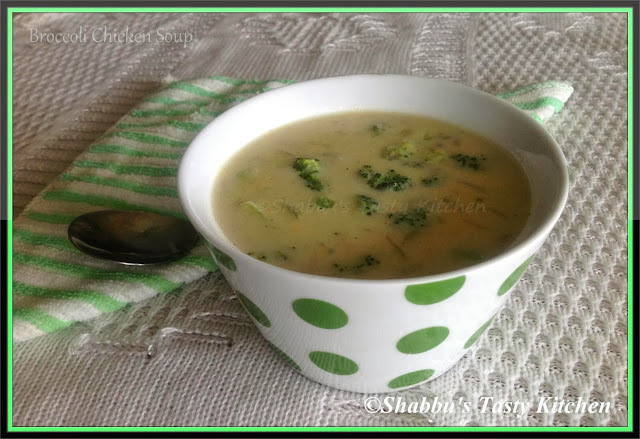 Healthy and delicious soup to warm up this chilled Winter.